Those little cows in the corner there are NOT Great Grampa Stark's. 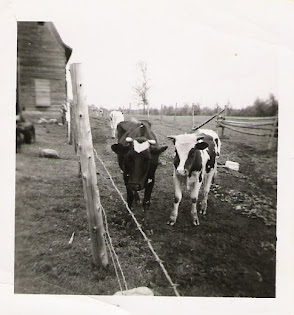 They were Gramma Bea's cows. One of them, Inky, was sold to pay the taxes on the farm one year. It was a big, fat, unhappy, hairy deal. Gramma was heartbroken. And Angry. It was the only fight my mom remember her parents having. Poor Inky. Poor Gramma Bea. In other news, Christmas is still coming. The fireplace is in and works wonderfully. I have to clean the house today. Wish me luck!